Provide comfort for the family of Marjorie Brown with a meaningful gesture of sympathy. If you have ever seen Margie smile, you will understand why she is loved by so many. She has a smile that will brighten any day. Her warm personality matches that bright smile. 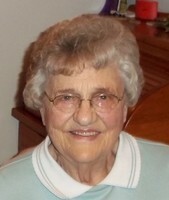 Margie was the 5th child and 3rd daughter of John and Vera Chappell. She grew up on a sugar beet farm in Pompey’s Pillar, Montana about 35 miles east of Billings. She went to grade school in Pompey’s and then to high school in nearby Worden, Montana. She fell head over heels in love with Marvin Brown while they ice skated on the community pond. He was so nice to her and always helped tie her skates. They were married on Thanksgiving Day after she cooked dinner for most of both big families. They loved, honored, and cherished each other for more than 65 years. Margie has a son and a daughter, 5 grandkids, and 7 great grandkids. She is also very close to many of her nieces and nephews. Over the years she has been a great friend to many. She always knows the right thing to say to make you laugh or feel better. Margie is a great cook. Everybody loved a meal at her house. Nobody left there hungry. But the meal that became legendary was her biscuits and gravy on Sunday morning. She has probably served a million biscuits and 10 thousand gallons of gravy over the years. Everybody came when they were invited because you didn’t miss a chance to have Margie’s biscuits and gravy. Marvin and Margie loved to travel. For years after Marvin retired, they would pack up the 5th wheel travel trailer and head out in search of new adventures. They have seen all 50 states. They spent spring break with the college kids at San Padre Island Texas one year. They saw the fall colors in the Northeast and the monstrous redwoods and sequoias in California and every bit of this country in between. It has been a great life for a great lady who has enjoyed the best life has to offer: love and laughter, family and friends. We will be celebrating the joy in her life on Monday March 25th at 11:00 at Smith Funeral Chapel Downtown on 925 S. 27th Street in Billings. Condolences for the family may be shared at smithfuneralchapels.com. To plant a memorial tree in honor of Marjorie Eileen Brown (Chappell), please visit our Heartfelt Sympathies Store.